Employee recognition is the timely, informal, or formal acknowledgement of a person's or team's behaviour, effort or business result that supports the organisation's goals and values, and which has been beyond normal expectations. 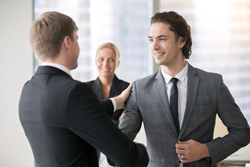 GoldIcon Enterprise discusses the power of praise and recognition. GoldIcon Enterprise are strong advocates for the use of continually recognising hard work, and the benefits they bring not only on a personal level but the impacts it has on the business on the whole. The firm has identified four key benefits which are. GoldIcon Enterprise is a sales and marketing agency based in Birmingham. The firm specialises in a unique form of direct marketing which allows them to personalise their direct marketing campaigns to meet the needs of their clients' ideal consumers. By connecting with customers on a face-to-face basis, GoldIcon Enterprise can establish long-lasting business relationships between brand and consumer which often leads to increased customer acquisition, brand awareness and brand loyalty for their clients. The importance of recognising hard work cannot be understated. Fundamentally, appreciation is a human need. Staff will respond positively to the recognition and appreciation of their work, as it confirms that they are valued by the company and their colleagues. Subsequently, when praise is offered, the levels of satisfaction and productivity will inevitably rise, and they are far more likely to maintain or improve their high levels of work in the future. It's no hidden fact that being praised ultimately makes people feel good about themselves. An increase in pride, satisfaction and improved levels of self-esteem are all fairly common responses as a result of receiving positive feedback. However, these responses are somewhat short-lived, so for recognition and praise to have any lasting impact on staff, it will need to be offered often and when warranted, too much praise can devalue the gesture. The firm is committed to praising and recognising the hard work of their staff; they do so via regular staff nights out and R&R retreats for high performers. "Our most important asset is our people, without them we wouldn't have a business. I believe that it's incredibly important to recognise and reward all the hard work they do. We want to create a strong company culture, and for that to happen we need a highly motivated workforce," stated Dwayne Foster, Managing director.